After much debate, this is the Kindle cover that I bought for one of my children. I was drawn to it by its built-in light and small size. My daughter loves to read in the car at night so this was perfect. On the whole, it's a lovely cover. It feels nice, fits perfectly to Kindle, is very neat and compact. The elastic wrap is sturdy & it's easier to use than some fasteners on other covers. The whole front flap folds back very well for one-handed reading. The light is bright & focused, though a little stiff to move in and out. I hope that gets better in time. The Kindle is held in with hinges, which work very well. I have those also in my M-Edge cover , and have always liked them. 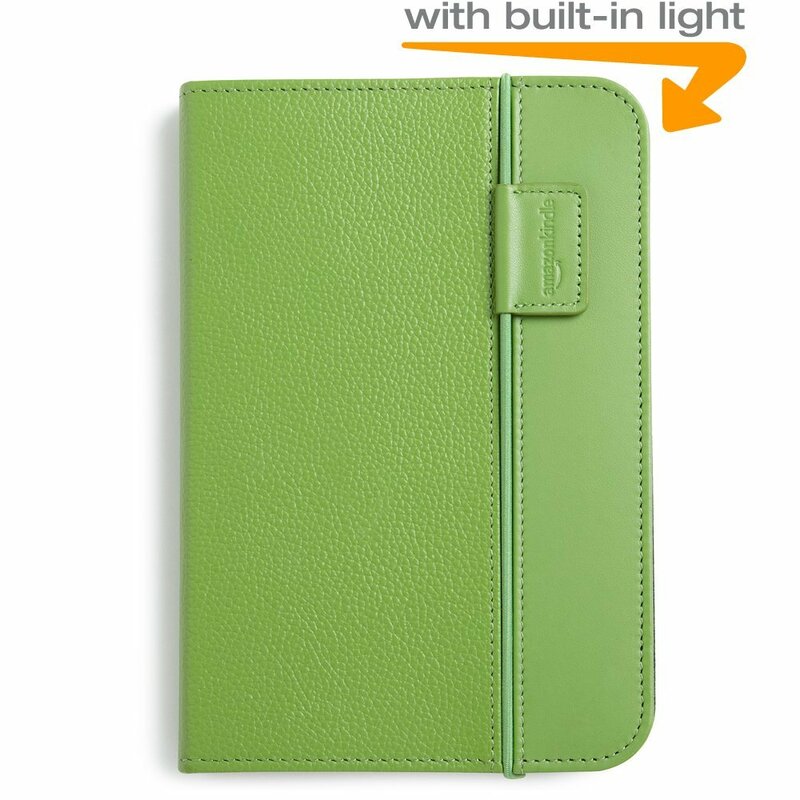 The inside of the cover is a smooth soft material. If it were mine, I would like to have small card holders on the inside flap. I use mine to carry around a credit card and a couple of business cards, or to hold cards people give me when I am out without my bag. However, my daughter said it doesn't bother her to not have that feature. 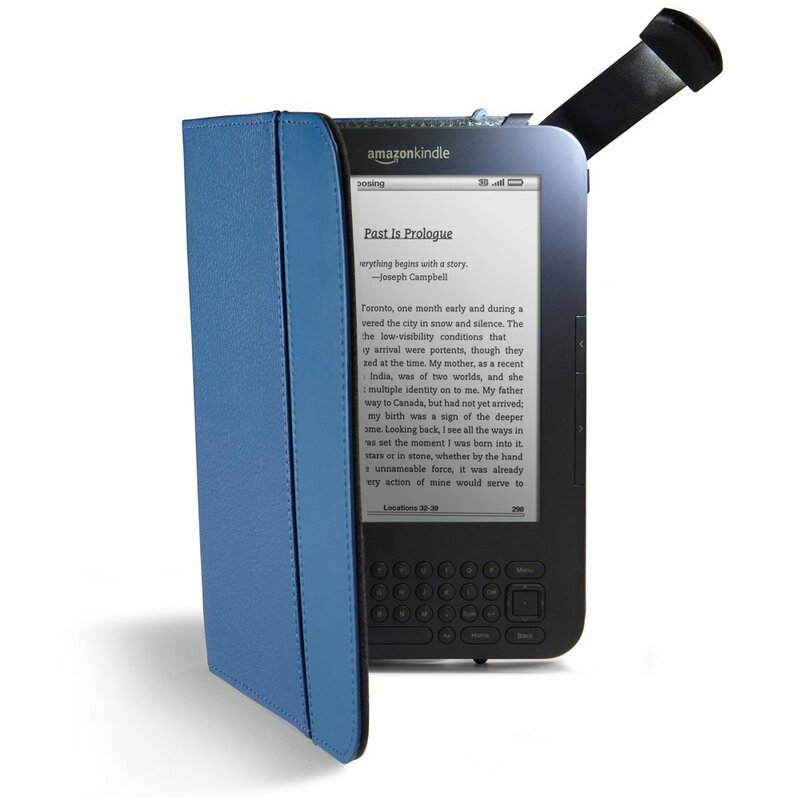 Without having corner tabs to hold the right-side corners of the Kindle, the device angles up a little. That wouldn't bother me, but it does bother my daughter so she does sometimes take her Kindle out of the cover to read. Sometimes, not often, but sometimes, the light distracts other people. Really, it totally depends on the angle it's being held at and where the other person is sitting. Side by side is okay, but if the other person is, say, on the other side of an L sectional, the light might affect them. I tested it while driving: I was driving and someone in the passenger seat read with the light and I didn't find it bothersome. On the whole, it's a very nice case. Pricey, yes. Its compactness is appealing and the most annoying aspect has been the slight tilt caused by the last of right corner tabs. I may come up with a way to add some though. A cover is really a very easy thing to make and the fact that it has any downsides makes it defunct as far as I'm concerned. At these kind of prices they they should be selling a perfect, top of the range cover not something that a blogger has to spend three quarters of a post apologising for. Um, I'm not apologizing for anything. I gave downsides and explained that some I could live with, some I couldn't. To many people, some of those things - like pockets - are not downsides. As for making one, sure! I've seen beautiful homemade covers. I've seen gorgeous homemade curtains too, and eaten lovely homegrown corn and lovely home raised beef. But that doesn't mean no-ones should buy anything ready made, does it? A comment too on price... Yes I deem this one to be quite pricey, but given that pricing of most ready-made covers ranges from $25 to $200+, it's pretty middling, by no means top of the range. Compared to $25 covers I have bought and returned, this is better. My own over was in the $40 range - but I then bought a $20 compact light to go with it. My daughter made the decision to keep this one, even with our perceived downsides, because she still prefers it to mine and others we've had. Really? $55 for a cover. No thanks. Well, I certainly understand, I guess that's why covers & cases range from $25 to $200... to suit every wallet and taste. Just like cars...I'd never dream of buying an expensive car because I just want something reliable and decent. Others would pay 10 times what I would because they want something sleeker or with more whistles. That's the beauty of a free market, right?